What's my favorite kind of cobbler? Peach. 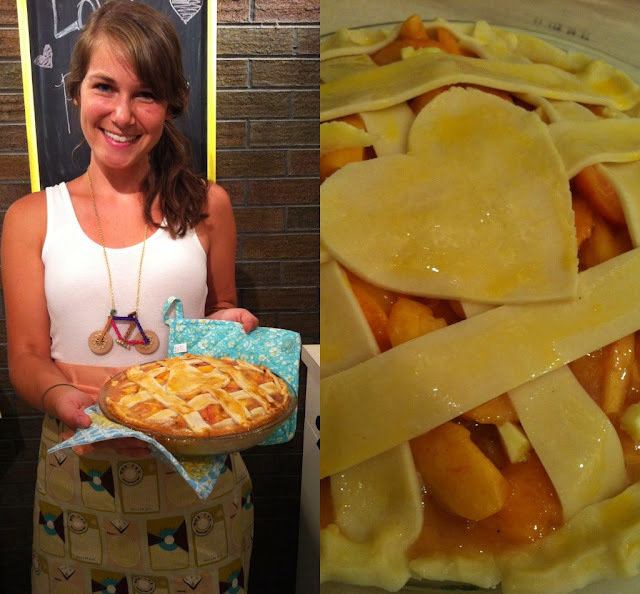 Why I haven't tried to make a homemade peach pie yet? Who knows. Despite that fact that two of the peaches I used were actually nectarines, the "pie juice" bubbled over & got all over the bottom of the oven, and the fact that I, again, used store-bought crust, this pie was perfection. Delicious perfection. 2. Place one pie crust in pie plate. You can bake for less than 5 minutes to harden up a bit, but make sure to poke with fork a few times so it doesn't puff up. 3. Gently mix lemon juice with sliced peaches in large bowl. 4. In a separate bowl, mix sugar, flour, spices, and salt. Again, mix gently with peaches. 5. Pour into pie crust & "dot" with butter. 6. Place other crust on top, brush with egg, and cut slits to allow steam to escape. 7. Bake for 10-15 minutes and then lower heat to 350°. Bake for an additional 30-40 minutes. looks delicious! and that necklace you have on is adorable! where is it from? Looks amazing! Agree with Victoria :) PS: Still loving my coffee cuff! 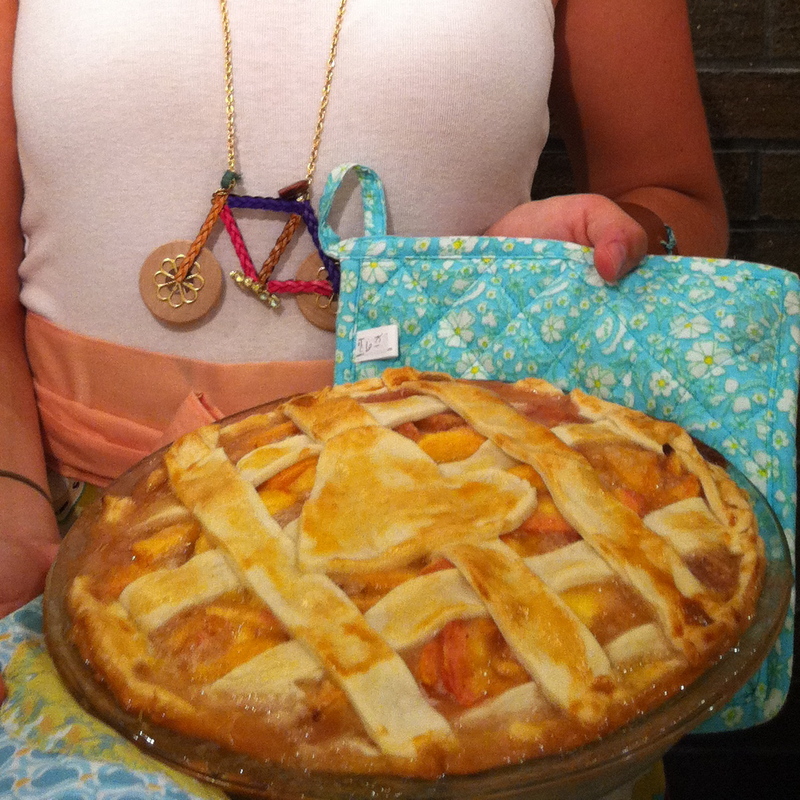 That pie looks great, but can we talk about that amazing necklace for a second?! Loving it! 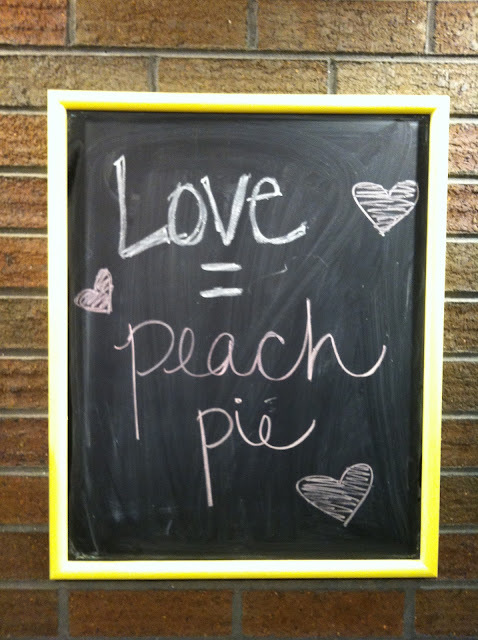 Yum I LOVE peach pie! I love old fashioned pies! Your crust is lovely! Funny, I've never had peach/nectarine pie-I bed I'd be in heaven! you did NOT put a heart on it.. that is just the greatest thing I've ever seen. Ahhh this looks too delicious, Kim! I don't like peaches, but that pie sure looks YUM! I just love cobbler period. And now I am starving for some. I love the necklace too. P.S do you really look that cute when you bake? LOVE your dress and necklace! So cute! What a beautiful pie!! I love the heart!